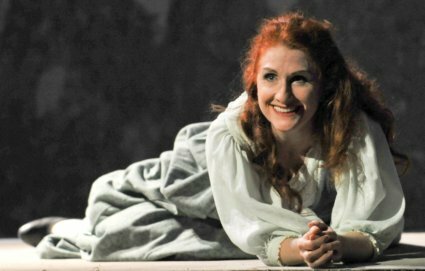 The role of his daughter Gilda is the most mportant Verdian role for a coloratura soprano. Gavanelli’s Gilda was Laura Claycomb. Hers is a lustrous voice, affecting in her duets with Gavanelli’s Rigoletto, passionate in those with tenor James Valenti’s Duke of Mantua. Claycomb was technically brilliant in Gilda’s great aria “Caro Nome”, which Claycomb delivered, singing prone on the upper part of a two story set, for which she received an audience ovation.